Tom Kibalo, who has four decades of engineering experience with a number of companies in the Washington, D.C., area, has developed a wide range of interests—including microcontrollers, robotics, embedded programming, and wireless applications. It almost seems too much to fit into a basement workspace, but he somehow does it. The key for Tom is having adequate light and keeping his scopes, probes, and other tools close at hand. 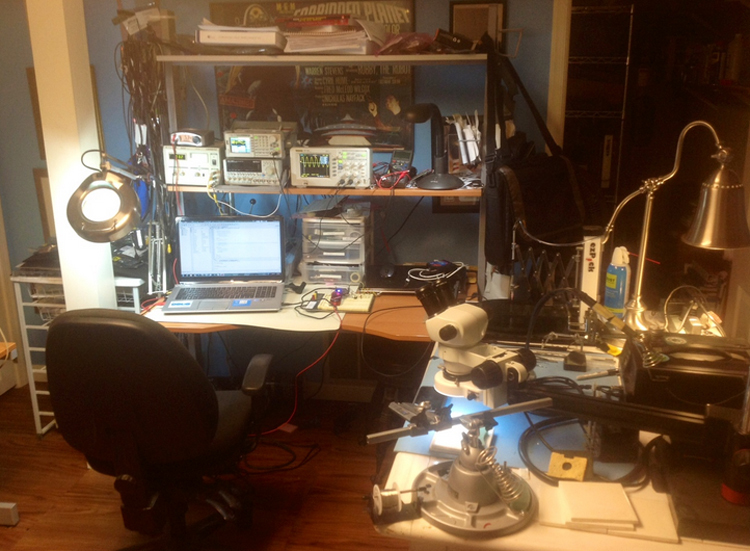 Tom, who is principal engineer of a large defense firm and CEO of KibaCorp, a Microchip Design Partner, recently shared with Circuit Cellar a photo and a description of his home workspace in Annapolis, MD. Here is what he says about his creative space. This is my basement lab. My test gear is on the main bench. I believe in lots of light. There is a series of power supplies, an arbitrary signal generator, a digital scope and a DVM. The scope, probes, and hand tools are kept handy, both on the sides and in the multi-drawer cabinet. The laptops , one open and the other closed on right, are used for software debugging, datasheet retrieval, and waveform capture. On the bench is a new product for insertion onto a Raspberry Pi. The other side bench is my solder rework station, a SMT pick and place, and a stereo microscope for inspection. On the far left is a closet with storage shelves for parts and working prototypes. Almost all of the projects are microcontroller-based applications. One of Tom’s projects was the focus of a “robot-boot camp” series he posted in Circuit Cellar late last year. His two installments, Autonomous Mobile Robot (Part 1): Overview & Hardware, and Autonomous Mobile Robot (Part 2): Software & Operation, explained how to utilize a basic mobile machine, a few sensors, and behavioral programming techniques in a robot design. Tom wanted to build a robot that could independently cruise, avoid collisions, and track a light source. The result was his TOMBOT, based on a Microchip Technology PIC32 microcontroller, a PICkit 3 programmer/debugger, and a free Microchip IDE and 32-bit complier. “A colleague came up with the name TOMBOT in honor of its inventor, and the name kind of stuck,’’ Tom said at the time. TOMBOT occupies a spot in Tom’s workspace, right under the bench on the right. That’s only one of the interesting ideas that have come out of Tom’s workspace. And it’s obvious he is planning more. In a Member Profile published earlier this year, he told Circuit Cellar about his latest project―a battery-powered Wi-Fi sensor network that uses low-power Microchip Technology PIC32 components. He has since completed and tested a prototype. This entry was posted in Workspaces by Circuit Cellar Staff.